Fleetwood Town boss Joey Barton sees shades of England star Kyle Walker in Wes Burns and sees no reason why Town’s new right-back could not compete in that role at the highest level. 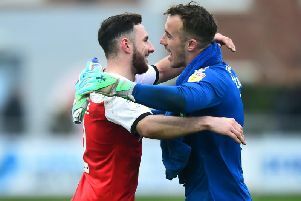 The 24-year-old switched from the front three to replace suspended full-back Lewie Coyle in Tuesday’s 3-0 win at AFC Wimbledon. Burns has seven goals this term and provided the cross for Town’s second goal in the capital, one Barton described as possibly his side’s best all season. The Welshman had played in the role previously for Bristol City and Barton says it is a position he could make him own. The Town boss said: “A superstar right-back that we have just found within the building! I thought Wes was excellent. “I’m not sure he will want to play there long-term but the way he played on Tuesday night, who knows? “He reminded me a lot of Kyle Walker in many regards Could I see him playing at the highest level in that position? If he carries on playing like that, then why not? And with Coyle forced to sit out two more games, Burns is expected to keep the job. Barton added: “I will have to break it to him gently because he probably wants to get back in the front line and score goals, especially when they are starting to put some really good numbers on the goalscoring board. “We scored two against Oxford, scored at Rochdale and three the other night. “Every forward-thinking player wants to score goals but Wes is a great lad, a great team person. He’s a very intelligent boy and footballer. The head coach explained that he chose Burns for the role rather than Nathan Sheron or Ryan Taylor because he wanted more attacking full-backs in his 4-3-3 system. And he told Burns to model himself more on Barcelona’s Dani Alves than on ex-Manchester United defender Gary Neville. Barton said: “Wimbledon play quite compact, and in the system we now play the full-backs have a more advanced role than they did before Christmas. “We knew there would be an out-ball and an opportunity to get into space and gallop. “The second goal for me is arguably the best goal we have scored all season – a fantastic team goal. “Wes did kind of give us what we were looking for in terms of speed in wide areas. “I was laughing with Wes in the build-up, saying, ‘Think more Dani Alves than kind of Gary Neville’ – both very good full-backs but slightly different in their approach. Wes certainly took that on board.